Most cyclists are explorers at heart. Finding unexpected gems and seeing unforgettable sights is a big reason why many of us climb into the saddle again and again. 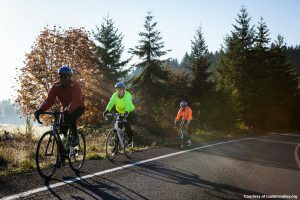 Just south and west of Portland awaits miles and miles of great roads, paths, and car-free trails to ride, including the picturesque 50 mile-long Tualatin Valley Scenic Bikeway (which features 21 miles of the Banks-Vernonia Trail). If you haven’t explored the Tualatin Valley and the northern Willamette Valley by bike yet, maybe it’s time you did. One particularly nice ride that flies a bit under the radar is around Scoggins Valley Park and Henry Hagg Lake, near Forest Grove. There are actually two options here – road or trail. The road route is 10.5 miles of the paved stuff making a loop around the lake. There is a fair amount of ups and downs making for a total elevation gain of 1,800 ft., but the frequent views make it well worth the effort. If you’re more in a mountain biking mood, there is 13+ miles of well-designed singletrack that encircles the lake. Just be sure to pay attention to the weather, because these trails do tend to get really muddy. 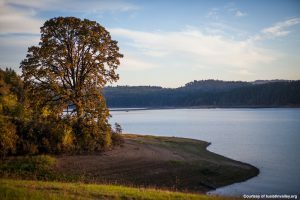 Whether you hit up Hagg Lake, take on a section of the Scenic Bikeway or opt for any of the more family-friendly paths, there is plenty of riding to be done in Portland-adjacent Washington County and the Tualatin Valley.